Arts & Crafts Cottage nestled into the rear expansive gardens. Offers 2 bedrooms,1x queen, 1x double, lounge room, full kitchen & king size spa bathroom. Features exposed Oregon rafters, slate floors & cottage furniture. Including 1 car park onsite. The Buxton Manor is a stunning 1909 restored large Mansion built in the William Morris ‘Arts & Craft' theme of decorative red brick with steep sloping roof lines. 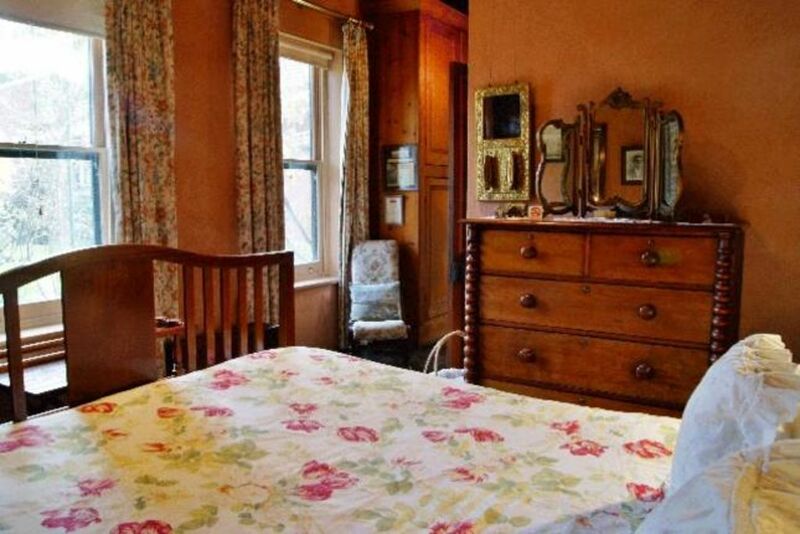 It houses our best collection of Australian antiques and memorabilia and features open log fires, polished spruce floors, decorative fireplaces, marbleized ceilings, rag rolled faux paint finishes, ornate ceiling roses, gilt mirrors and sumptuous antique beds. Buxton Manor features 4 separate very large apartments and 1 spa cottage, all of which offer private entrances, bathrooms, fully equipped kitchens, unique living areas and valuable rare furnishings. Buxton Manor is surrounded by half an acre of manicured, welcoming gardens with masses of old fashioned scented roses, cottage flowers and sweeping lawns. It has been heritage listed by the State government and completely restored, and features half an acre of manicured gardens with outdoor designer furniture, umbrella's and 2 wood fire BBQs. North Adelaide is the perfect base for your Adelaide stay. Just a short stroll from all of our properties is over 80 of Adelaide's best cafes and restaurants. Complimentary delivery of room service is also available from ‘Beyond India Restaurant'! We also offer a complimentary shuttle bus service, with use of the World's first Solar Electric Bus, which loops into the city passing many of Adelaide's most popular tourist attractions! North Adelaide is blessed with the widest and best selection of restaurants and cafes in Adelaide. From the top award winning silver service eateries, 10 restored hotels, many ethnic restaurants and a proliferation of casual well designed cafes all featuring personalised service! Our staff are familiar with all of these options and their proprietors and are happy to help you with your selection!